Morning... 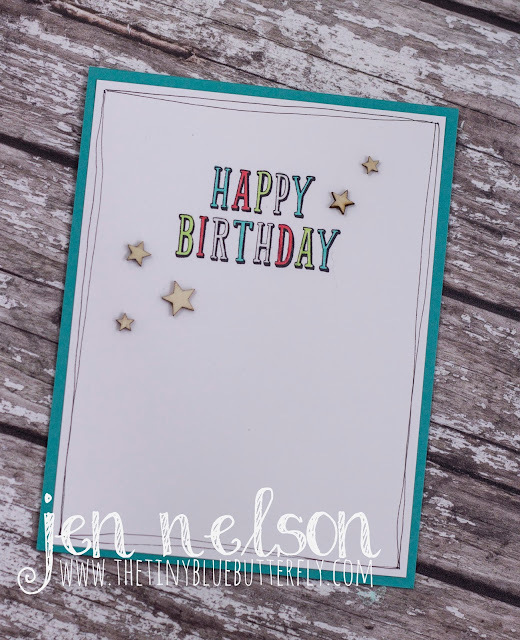 I have one more card for you made from the Birthday Wit set from Stampin Up. I had stamped this out when I made the others but had done nothing with it. The sentiment was stamped in black ink and then I coloured it in with copics in bright colours. I trimmed down the panel before adding some wooden star embellishments and a doodling around the edge. The panel was then mounted onto a card base made from Bermuda Bay card stock from Stampin Up. I finished it off by adding a little wink of stella onto the wooden stars. Yesterday I went to the craft show in Bolton and then spent the rest of the day crafting my little heart out with stuff to show you over the next couple of weeks.